Bundt cakes are my favorite. They are quick to make…mix, pour, bake. Once cooled, you poor over a simple, beautiful glaze. It runs down the sides, making it completely irresistible. I’m a cake girl, not a frosting girl. So I like cake that has a higher cake-to-frosting ratio. Bundts are perfect. Oh, they are stunningly rustic too! 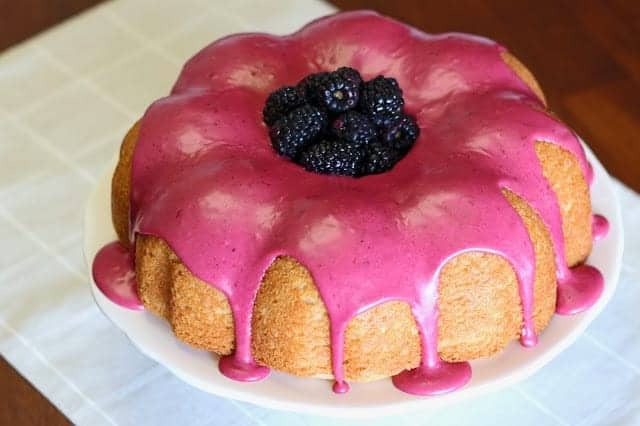 This gluten free vegan lemon blackberry bundt cake really is as good as it looks. The cake is very similar to a moist pound cake. It’s packed with fresh lemon too (you KNOW how I’m obsessed with lemon). That glaze. I can’t stop thinking about that glaze. 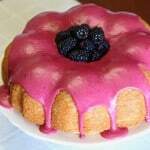 Made from fresh blackberries, it just enhances the flavor of the lemon cake. So fresh and so bright. I think, actually I’m certain, you will fall in love with this cake at first bite! Preheat oven to 350 degrees. Prepare bundt cake pan by spraying with cooking spray. In large mixing bowl, sift together flour, baking powder, baking soda and salt. In separate bowl, mix together coconut milk and lemon juice, until curdled. Add sugar, applesauce, oil, lemon zest, vanilla and lemon extract. Pour over flour mixture and stir to combine. Pour batter into prepared bundt cake pan. Bake for 43-45 minutes or until toothpick inserted in cake comes out clean. Allow to cool in pan for 10 minutes before removing from pan. Continue to cool on cooling rack. To make blackberry glaze, start by smashing 1/2 cup blackberries through fine-mesh sieve to make blackberry puree. Add powdered sugar to blackberry puree. Pour in 1 tablespoon coconut milk and vanilla extract. Add an additional tablespoon coconut milk, if needed. Stir until smooth. Pour over cooled cake. Garnish with remaining 1 cup fresh blackberries. Slice and serve. This entry was posted in Baked Goods, Desserts, Recipes, Recipes & Techniques by Cooks We Love, Vegan and tagged autism, autism diet, autism gluten free, autoimmune disease, cake, celiac, celiac disease, celiac health, food allergies, g-free, g-free dessert, G-Free Foodie, gluten allergy, gluten free, gluten free baking, gluten free cake, gluten free cooking, gluten free diet, gluten free food, gluten free mommy, gluten free parent, gluten free parenting. Bookmark the permalink.